Si, me hablo un poco Español. Haha.. And that’s about it. I only studied Spanish for a semester. So… it’s pretty weak. Muy mal. I have a little bit of vocabulary tucked in my sleeve mostly because I’m Filipino. It was funny sitting in Spanish class going ‘Hey! I know that one’ on every other word. My Mexican teacher was also the first (and only) university staff who was able to correctly pronounce my family name on the first go. Ah good times. Filipinos don’t always say it right, I had a teacher call me Georgie … where did that come from? 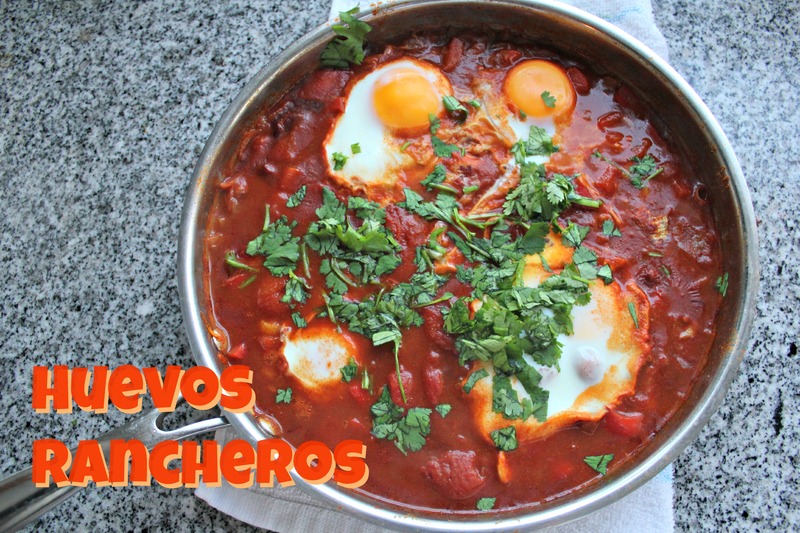 Huevos Rancheros or Rancher’s Eggs. I don’t know but I just had the urge to make these. I have never tried it before I cooked it. I actually found out about it while playing Order Up! on the iPad. Hehheh… I crave for some Mexicali when I play that. So I was quite excited when I found Sortedfood’s video on it. Cooking cooking here I come. For real, this time. Baked tortillas to go with it. I love the smell of coriander. Oh man. It tasted awesome. Those spices just went out and had a fiesta. 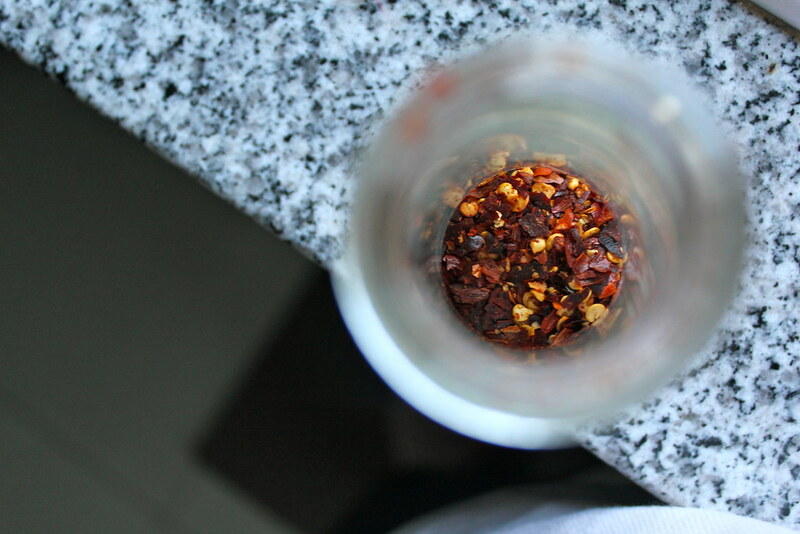 Though, I might’ve tipped the jar of chilli flakes a bit. Hahah…Hot and tasty. I’m not used to the hotness so I had a bit of sour cream on the side to extinguish some heat. 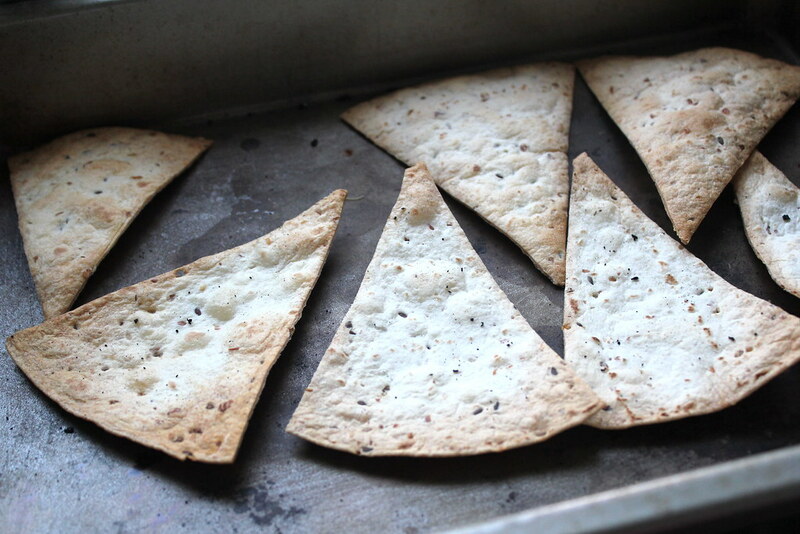 – Cut the tortillas into wedges and bake in the oven for 10 minutes, until crisp. 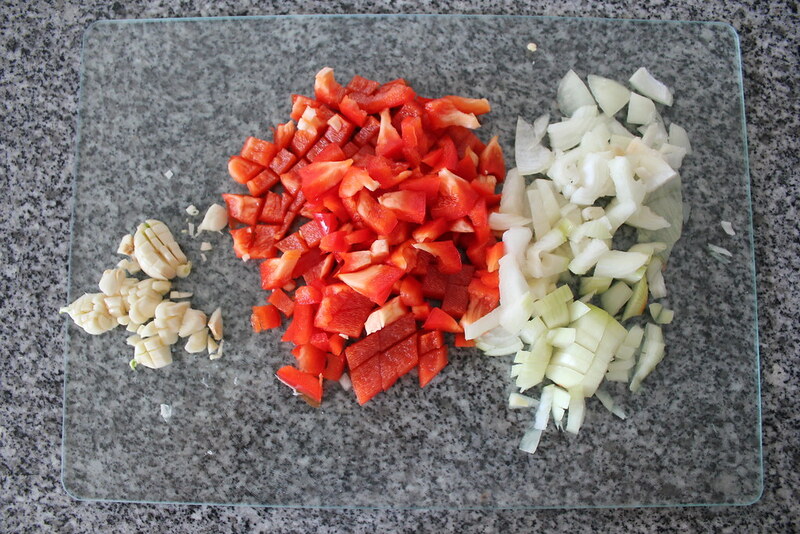 – Dice the onion, chilli and red pepper. Then mince the garlic. – Heat the oil in an ovenproof frying pan and throw in the onion, garlic and chilli to fry and soften the onions. 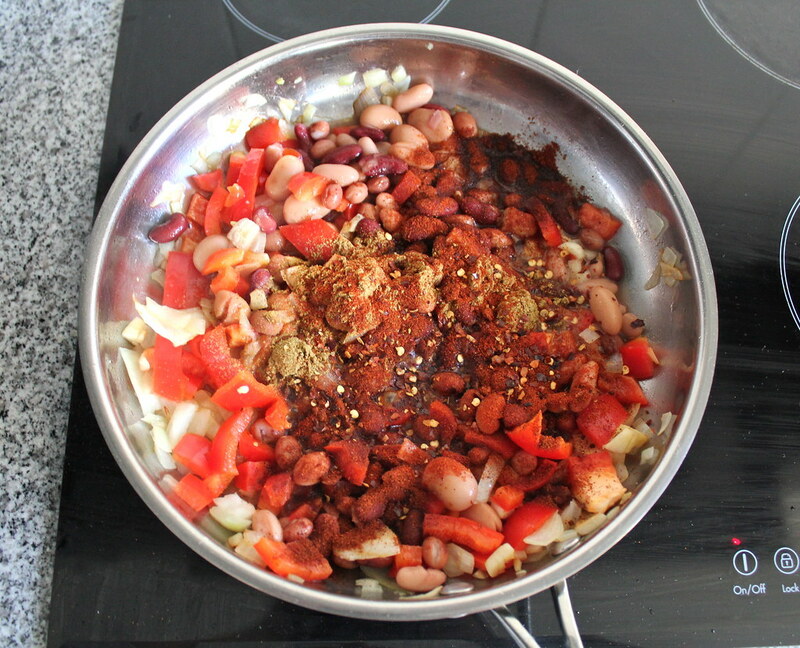 – Add the diced pepper, black eyed beans, cumin and paprika [and cayenne and chilli flakes if using that], then mix together. 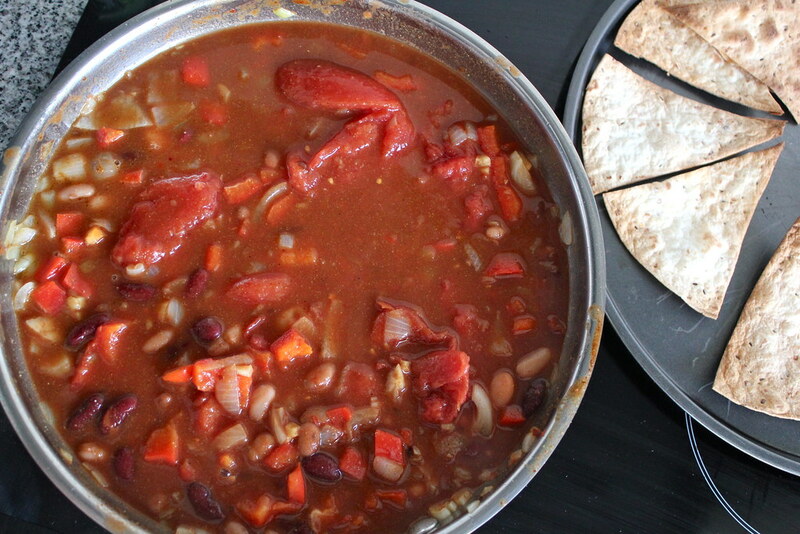 – Coat the beans and veg in the tomato purée, then pour over the tinned tomatoes and veg stock. – Simmer the mixture for 20 minutes and turn the oven up to 220 degrees Celsius. 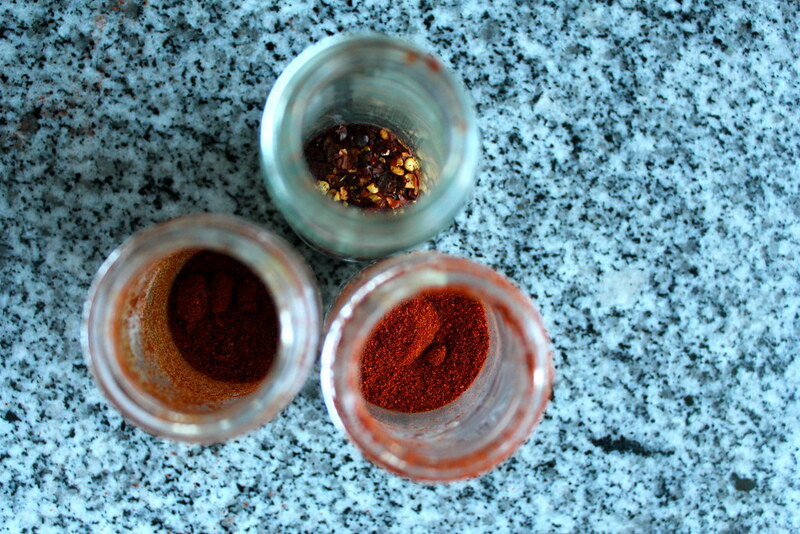 – Make 4 wells in the bean mixture. Then crack an egg into each well. – Bake in the oven for 5 minutes. 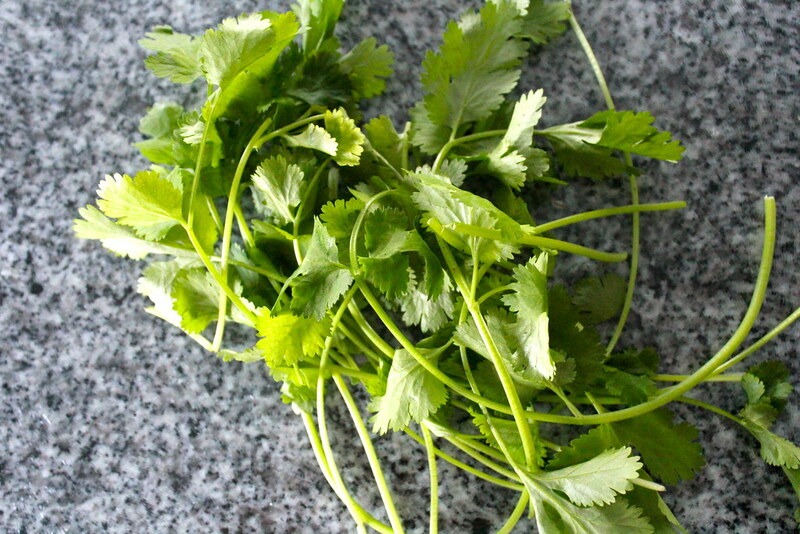 – Scatter fresh coriander on top. Serve with the baked tortillas. I hope this is the start of more cooking to come! I’m trying to learn how to cook more things. Tried this for the first time and quite happy this went well haha. Tasted great that my dad didn’t even notice that it was meatless. Huzzahh! I’m going to add this to the awesome monthly link party Our Growing Edge. This event aims to connect food bloggers and inspire us to try new things. 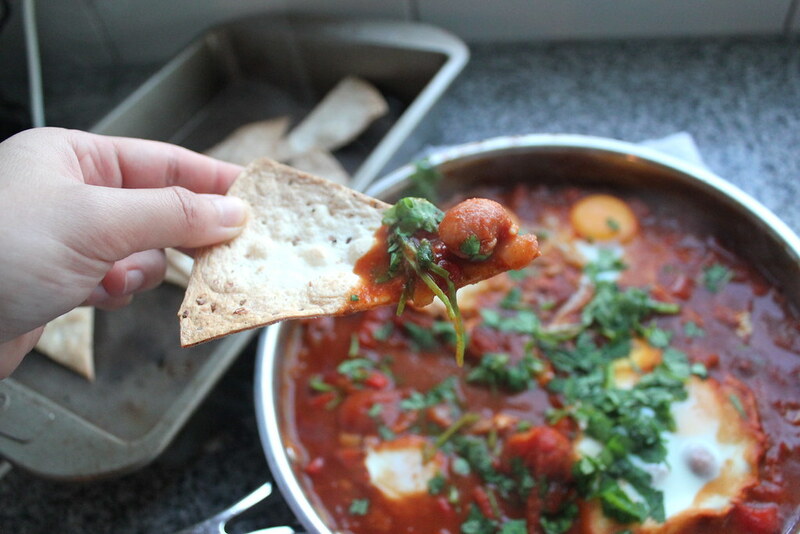 I’m rushing to link to this month’s link party hosted by Stacey from The Veggie Mama. Yay! Your eggs look divine. Nicely done. Great submission to Our Growing Edge! Yum. 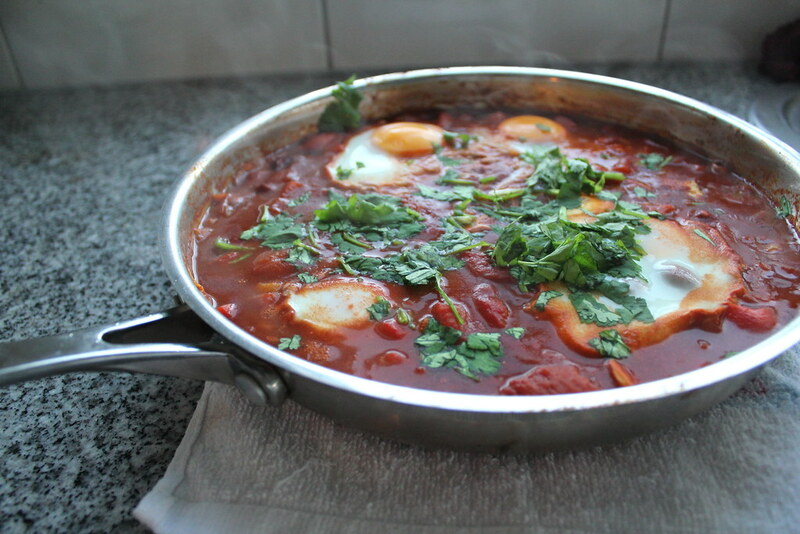 I love *just cooked* eggs and handfuls of coriander too. I love restaurant/cooking games! I’m glad I’m not the only one. They are so addictive. My favourite at the moment is Cooking Dash. I haven’t played Order Up! much but if you’re cooking real food because of game, that’s a good thing. The other day I was well into a game when my husband was hinting that he was hungry for dinner. I know they really are addictive! I liked the Mexican restaurant stage of Order Up!, I haven’t tried Cooking Dash. Cooking Mama on the iPad is cute too but needs money to unlock more recipes. I’m pretty much hooked into anything as long as it’s about food. Hahah. If only we can swipe the food in the game and it actually becomes real food on the table. Playing games and watching tv shows and food-centric anime make me crave food I’ve never eaten before. 😀 So that leads to cooking and baking most of the time. Me too. I can’t count the number of things I’ve eaten or cooked just because of TV. And not even food TV. Non-foodie movie The Avengers apparently created quite a buzz for shawarmas because the characters kept mentioning them. Then the credits at the end cinched it. XD I totally missed that shawarma eating scene at the end when I watched it. Dang. haha..
Now I feel like eating some..
Huevos rancheros are my favorite. I order them nearly every time they’re on a brunch menu. I do make them at home occasionally, but not as much as I’d like. Looks great! Sadly, I haven’t been to any place where they serve Huevos Rancheros for brunch. At least I know how to make it now hehe. Great job! 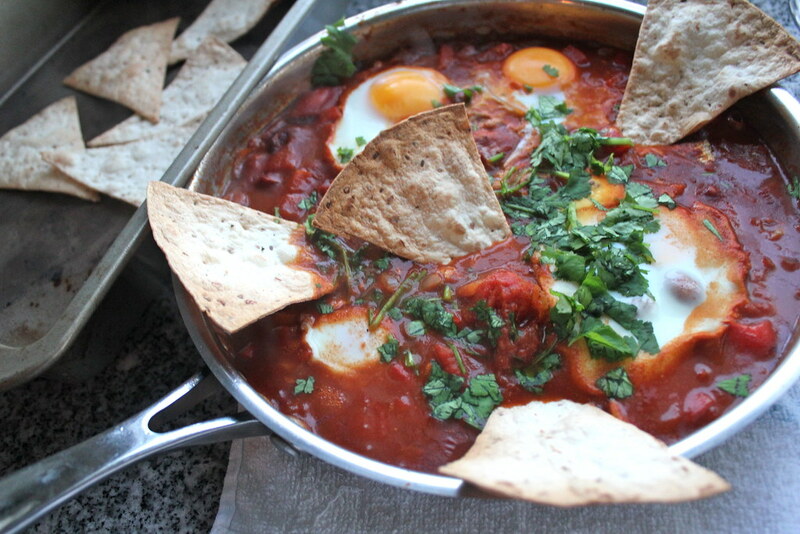 Your photos are amazing too – your huevos rancheros look totally drool-worthy. 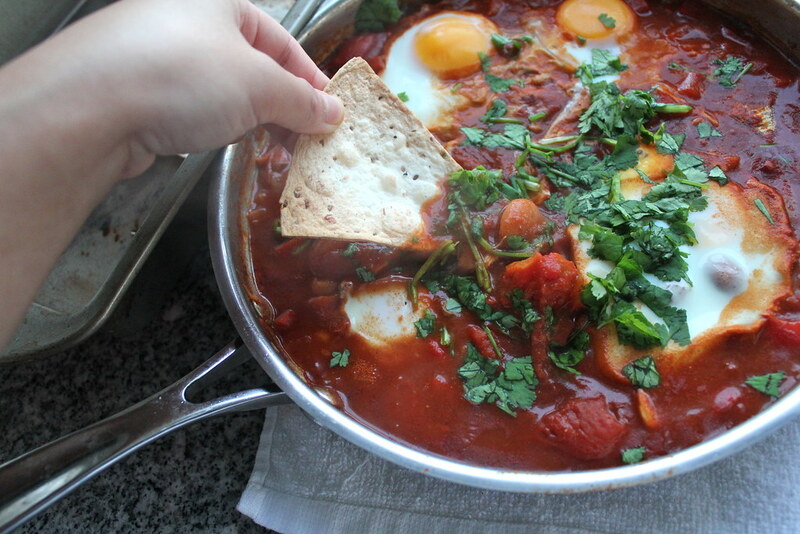 I haven’t tried making these before, but I have made shakshuka, which looks very similar with eggs and tomato, but no beans. I think I would actually like the Mexican version more, so this is going on my to-do list. Thanks for sharing! 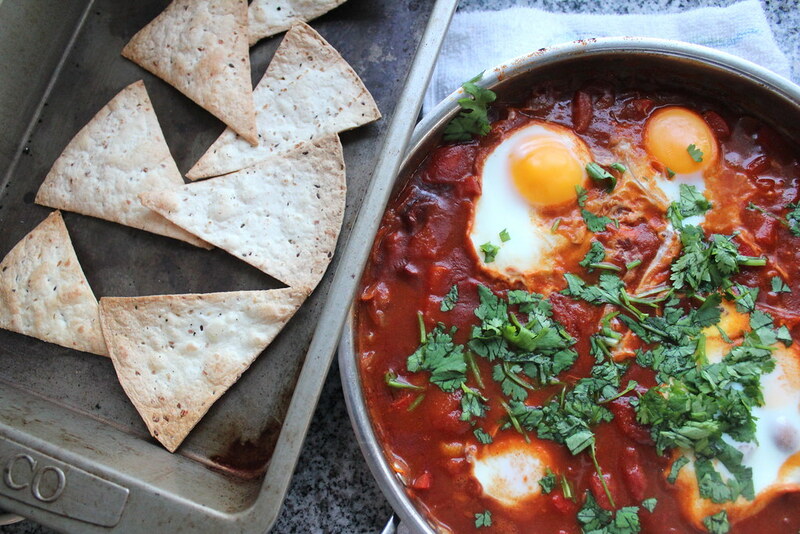 Ahh shakshuka and huevos rancheros really are quite similar…they both have cumin and all that. Guess the beans and tortillas would be the difference. Cool!